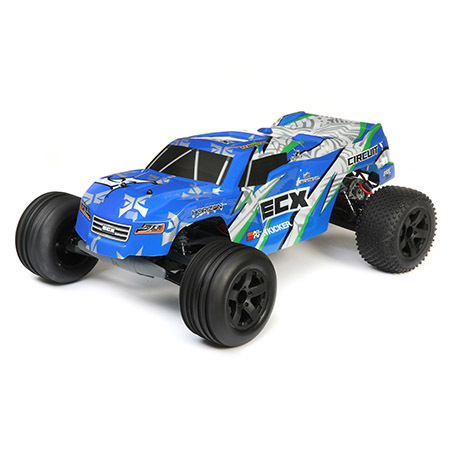 Drive as recklessly as you want without consequences with the ECX® Circuit™ Stadium Truck. This merciless hellion doesn’t back down even in the roughest environments due to waterproof electronics, nylon composite chassis, and well-known ECX durability. It leads the charge with savage features such as Spektrum™ STX2™ 2Ch 2.4GHz FHSS Radio System, Dynamite® 15T brushed motor, and Dynamite® waterproof and LiPo compatible Tazer™ 15T ESC. Pick your power, charge it up and take on all comers. 6C-7C NiMH or 2S LiPo Battery with EC Connector Battery and Charger.